The warm waters off the Top of the Island are the summering grounds for an impressive variety of whales. minkes, pilot whales, fin whales, sei whales and humpbacks, as well as the occasional pod of belugas, all take their summer vacations off, and mostly in sight of whale tour operations at the Top of the Island include both sailing and motorized vessels. Bay St. Lawrence wharf. Daily tours (1- to 2-hr) on 7.5-m (24-ft) Zodiac. Hydrophone to hear whales. Experienced marine biology guide. Photo identification of returning pods. Seal rookery, seabirds, dolphins, moose, bear; shipwrecks, seacaves, waterfalls, spectacular geological formations. Reservations recommended. Watch whales, eagles, seals and seabirds at the Top of Cape Breton Island with the Fraser family. 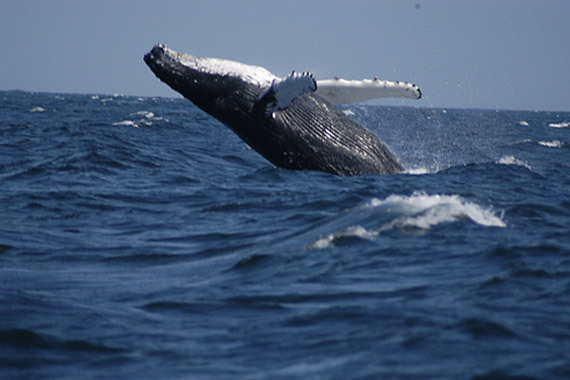 Locally owned and operated, Oshan Whale Watch offers guided tours with a coast guard trained crew. Our boat, the Oshan, is a 42-foot, hydrophone-equipped, Northumberland Strait-style vessel: ideal for the cliff side coastline of the Top of the Island region.Tours depart daily at 10:30am, 1:30pm and 4:30pm. Whale sightings guaranteed: 100% customer satisfaction or your money back!